Big Check Bracket Racing’s March Driver of the Month is Chris Gulitti. Chris was voted Driver of the Month by South Central Drag Racing and Big Check Points Series members. Chris’s latest win came at the Texas Triple Tens race in March. On Sunday, Chris had two entries at the semifinal round eventually winning the $20K final round. How long have you been racing? CG: 35 years since my 1st pass down the track at the old Houston International Raceway. Which class or classes do you compete in? CG: I left Top Sportsman and Top Dragster for big money bracket racing with a few dragsters. Where do you normally race? CG: Our home track is Houston Raceway Park. Tell us about your current race car. CG: We have four as of now, 2 American Dragsters, 1 Johnny Ezell Dragster, and we just added a 1994 S-10 to the stable last week. Please list your major racing accomplishments. CG: 1 NHRA Division 4 Top Sportsman championship, 3 IHRA Division 4 T/S championships, 1 IHRA Top Dragster Division 4 championship, NHRA T/S driver of the year, IHRA T/S All-stars champ, 2001 IHRA Division 4 bracket champion, and many time big money bracket winner. 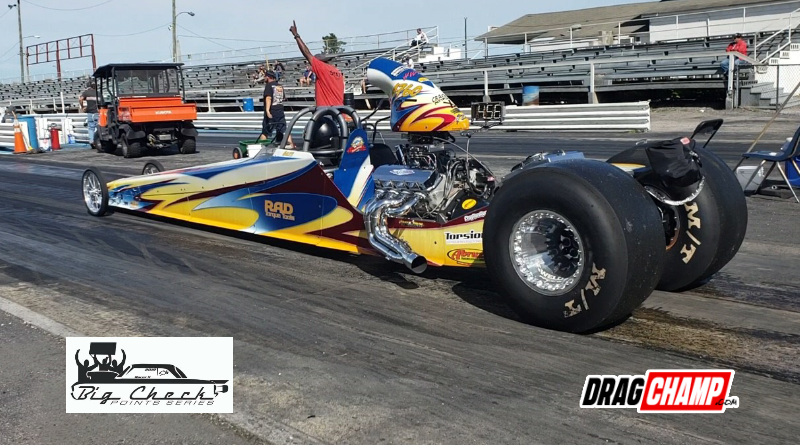 Check out Michael Holcombe’s Racer Spotlight article here. CG: To see me or help my son Cory win a Million Dollar race! What is your favorite race car, and why? CG: My old 1998 T/S Firebird. That car found winners circles even when I should not have won! Tell us what you do for a living? CG: The company my wife Geri and I own sells RAD and Torsion X Torque Tools. We offer sales, service, rentals and calibrations…cheap plug eh? How do you support your racing, side hustle, sponsor, partner, etc.? CG: My HIP pocket is my only sponsor…less stress with no obligations or behavior guarantees! Who do you hate to see in the other lane, and why? CG: My son Cory, he is better than me! But I have to admit after beating him in two $10K finals last year he might wonder? What’s the hardest part of drag racing? CG: There’s SO much big money bracket racing and simply not enough time! What’s your most embarrassing moment in a race car? CG: It has to be spraying it in reverse after backing up from a burnout…I was trying to do a dry hop…around 30 years back. We should bring back dry hops on the spray IMO. What are you saying to yourself just before you stage the car? What do you enjoy the most at the racetrack? CG: OH heck yeah…I cant tell you how many times I have won in RED underwear! Which are you better at the starting line or the finish line? CG: Around the 60 foot clock…I ask myself, DID you just miss it again? What motivates you to continue racing? CG: The thrill of victory, the comradery, the competition, and the atmosphere. If money were no object, what would your racing operation look like? CG: Car, trailer, class, race schedule, etc. just like it is right now…I clearly spent too much the 1st time! How often do you use a practice tree? CG: I don’t, no sense in wasting good hits at the tree! What is your daily driver? CG: 2017 Denali pick up truck. CG: I liked the MULE with Clint Eastwood recently. Where do you spend the most time on the internet? What is your favorite sport? Favorite team? CG: Racing, no teams in racing except the bracket finals, of which are fun as well. Besides racing, what do you do in your free time? CG: Work on race cars and clean everything in sight! CG: Have not found that yet! CG: I CANT STAND waiting in lines! Would you rather hang out with a crowd or have a quiet evening at home? Who would you like to thank, who helps you the most? CG: Thanks to our business Torque Tools Inc, Rad Torque Tools, Torsion X, Spanky at Wilson Race Engines, Marco at Abruzzi Trans and converters. My wife Geri who busts her tail week in and week out. She is Cory’s and I backbone and largest supporter!